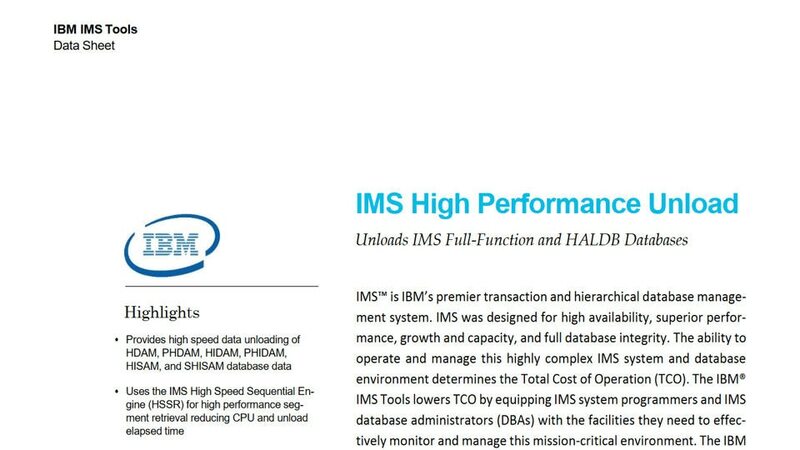 IMS™ High Performance Unload for z/OS® provides high speed unloading of IMS databases and improves the performance of IMS data retrieval application programs by using the unload application programming interface (API). It saves you time and money by reducing the CPU and elapsed time that is required to unload IMS databases and to run IMS data retrieval application programs. It also provides powerful functions such as the ability to continue processing after a pointer error, a user exit facility and various unloaded record formats. Substantially reduces the time and resources needed to unload databases. Provides the high performance High Speed Sequential Retrieval (HSSR) Engine. The unload utilities and the application programming interface (API) use the HSSR Engine to provide fast retrieval of data. Offers user control and exit capabilities not found in the base utility, such as unloading compressed data without decompression overhead and a user exit facility for added processing of each segment. Unloads HALDB, HDAM, HIDAM, HISAM, and SHISAM databases – and even broken data sets. Includes a variety of statistical reports for better tuning.